Today's photo treasure is not a single photographer and her work, but rather a whole group of photographers! I have recently obtained a wonderful book entitled Living landscape (it is a German book with the original title Lebende Landschaft). The coffee table book features nature photographs from a group of photographers from South Tyrol that calls itself Strix. The name is taken from the scientific name of the tawny or brown owl (Strix aluco). Most photographs were taken in South Tyrol, a region in the north of Italy that is home to some of the most beautiful and impressive mountain ranges; the Dolomites. A smaller selection of photographs takes the reader to Austria, Iceland and Scandinavia. One of my most preferred photographs of the book is the golden edge of light in the wintery mountains by Helmut Elzenbaumer shown above. Since 23 different photographers contributed to the book it abounds in diverse styles, different subjects and unique point of views. A common theme is the harmonious integration of wildlife with the environment. Many photographs go beyond pure landscape views or wildlife shots but incorporate wild animals as part of the scenery. 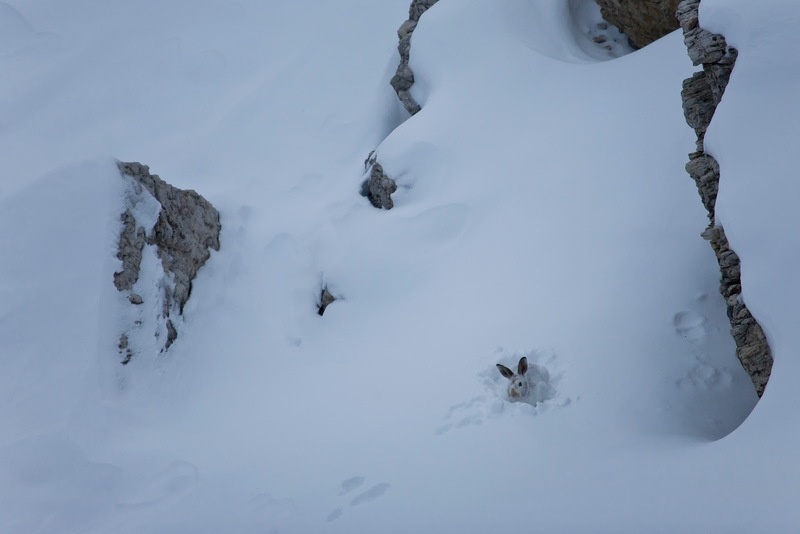 The hiding mountain hare photographed by Johannes Wassermann is one example. Other photographs feature the animals more prominently - here, a nuthatch singing out loudly comes to my mind (photographed by Carlo Dapoz). In addition to the photographs in the wild mountains of the Dolomites, one chapter features animals and impressions from man-made environments, such as the northern lapwing that is chasing away roe deer. I hope you enjoy and wish you a nice day! In honor of Easter I am showing you two photographs of a black-tailed jackrabbit in Joshua Tree National Park (of course without watermark and all). I still remember very well when I saw a pair of these impressive ears the first time. We had just arrived in the US for the first time and drove directly to Joshua Tree National Park. In the evening, a black-tailed jackrabbit inspected the campground and constantly rotated its ears in all directions like radar antennas while hopping around. An unforgettable sight and lasting memory! During the preparation for this post I have learned that Easter is basically a fertility celebration. 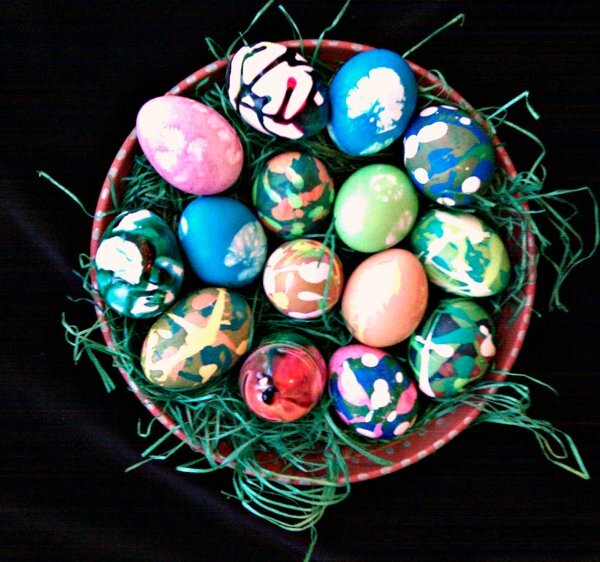 The name likely originates from a goddess of fertility and Easter rabbits and eggs have become associated with Easter since they too are symbols for fertility. The two photographs are actually misleading, since the jackrabbit is not a rabbit at all, but rather a hare (please apologize the finickiness - I am a biologist). So to finish the Easter blog post correctly, here is a picture of our (rather our children's) Easter eggs of this year. I wish you a fertile Easter holiday and hope you visit again! I have somewhat lagged with blogging recently - not because of laziness or demotivation. I was busy working in my digital darkroom and photographing! City trees is another new gallery that I have added recently, just like the drapes and blinds introduced not too long ago. Of course also without watermarks and under an BY-NC-ND creative commons licence. A recent blog post by Carl Weese depicting and entitled "City trees" encouraged me to present you my still small collection of this theme. So far, there are only few photographs, but more will follow. 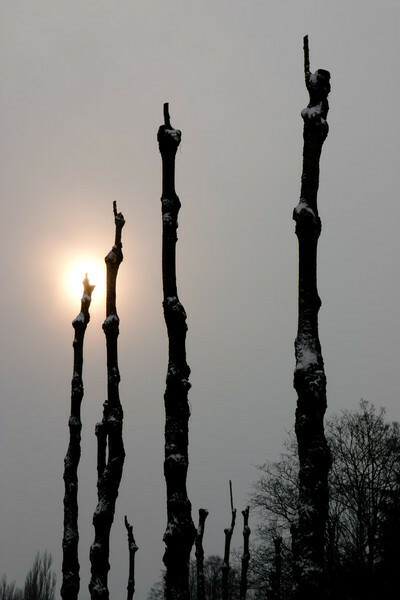 Similar to the trees collection introduced in an earlier post, city trees is made up of photographs from close or far and from trees in groups or solitude. However, the urban environment in the form of colorful walls, facades or buildings is part of the compositions and the trees have of course been planted - that's why the collection is part of Man-made beauty. I appreciate the contrast between the convoluted and complex branches and twigs and the straight lines and shapes of city architecture, which are often emphasized by harsh color contrasts. In some cases, however, the trees seem abused and forced into a shape and pattern more in line with the city environment (as in THIS example).